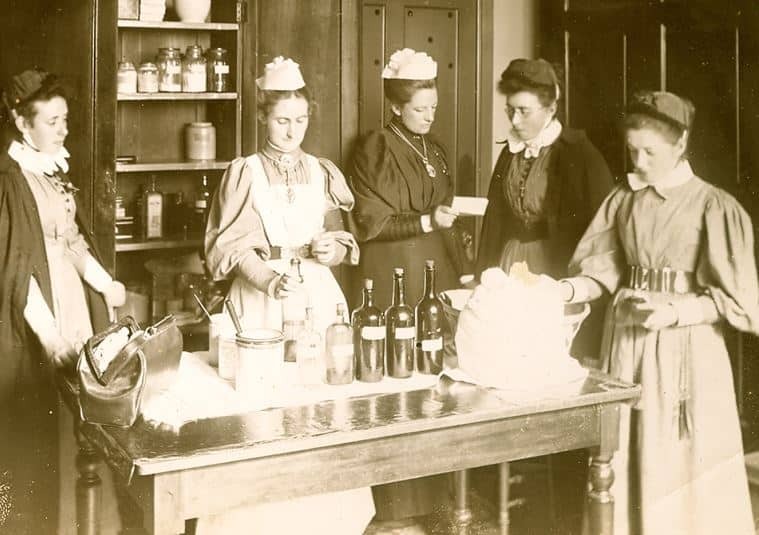 Wider concern for poor women and children led to a flurry of initiatives across Edinburgh. The focus was on hospital care but most of these also offered their own district nursing. 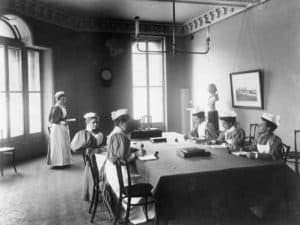 The Deaconess Hospital in the Pleasance opened in 1894 funded by the Church of Scotland on the same principles as the Deaconess movement in Germany where Florence Nightingale first started nursing. 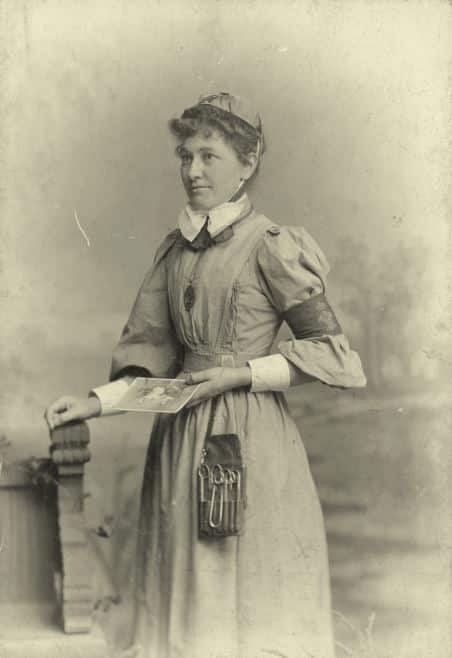 It mainly trained nurses for missionary work overseas. 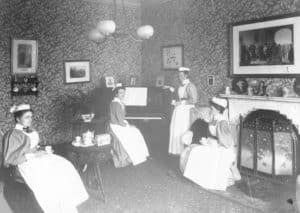 Bruntsfield Hospital acquired its first beds in 1885 and worked closely with the Hospice established by Elsie Inglis in the High Street. The first Queen’s Nurses started their rounds in the Grassmarket, walking first past the hovels which housed Burke and Hare. They would see grandiose new buildings spring up close by – Caledonian railway station (now demolished), the Usher Hall, and the original Ross Fountain (restored in 2018). Their work, however, was with families in the slum tenements. A typical day started with rising at 6.45am and out on their rounds at 8.30am. Each nurse had a favourite dairy in her district for a reviving glass of milk in the forenoon. Back to Castle Terrace for dinner at 1.30pm and discussion of the morning’s cases. Then writing up notes or lectures on various subjects. After tea in the drawing room they went on their second rounds at 4.30pm, returning for supper at 8.30pm and more paperwork. Finally, there was time for prayers, relaxation with books and a piano before bed at 10.30pm. More cases came in during the course of the day. Sunday was a day of rest with only the most urgent cases visited. Like other Scottish organisations, the Institute benefited from close networks – people knew each other, served on the same committees, and often lived close by. Joseph Bell wasn’t its only surgeon supporter. So too was Sir Harold Stiles – who lived just round the corner road at 5 Castle Terrace and his pupil Sir John Fraser who helped with fundraising. Both had interests in the health of poor women and children. In 1913 Fraser showed that 60 per cent of TB cases in children were caused by bovine TB in milk.